Hey! Welcome to my Scholars e-Portfolio. You can find out what I did over the past couple years in my Year to Review. My artifacts will show some interesting clubs and volunteer experience I participated in. My professional achievements are in the Career tab. Feel free to look around and find out more about me. It’s crazy to believe that I am already halfway through my time here at OSU. It’s been going by really fast. By this time next year, I will be applying for medical schools! I feel like I am on track for getting all the required courses and research that I need for med school applications. 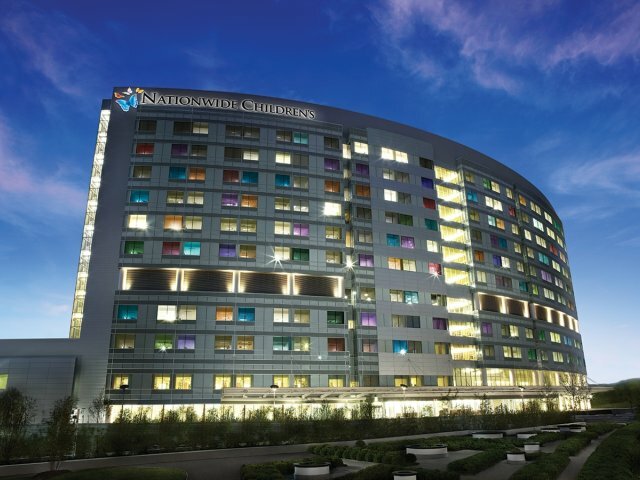 I am going to continue my research at Nationwide Children’s over the next couple years. I’m done with taking all of the core sciences and only have general education classes and my major classes left. My GPA is lower than I would like it to be, but I expected it to drop because of the courses that I took this year. I’m hoping it’ll go up from now on because of my Gen Eds and major courses. The other thing I need to work on is my volunteering hours. I have some clinical hours at James Cancer, but I’ll need a lot more before next year. I also need a lot of non-clinical hours. I am planning on joining the Red Cross and helping out with Blood Drives. This will get me a lot of non-clinical hours. I also get non-clinical hours through my organization Fresh Start, but I’ll need more. For clinical hours, I am hoping to join some doctors at NCH to go abroad for doctors without borders trip. I feel like it will give me lot more experience working with patients, and I will also get clinical hours. This year, I joined the OSU PenPals organization. Each student gets assigned a PenPal from one of the Columbus elementary schools and write letters to each other. At the end of the year, the penpals come to OSU for the day. It was a really fun experience to be a part of this organization. 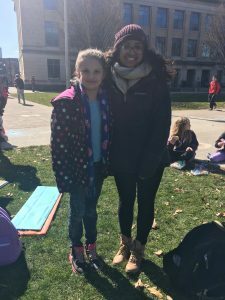 I got really close with my penpal, and we both had a lot of fun writing to each other. We also had a lot of fun on the day that they came to OSU. We played games on the Oval and went to the Orton Museum. 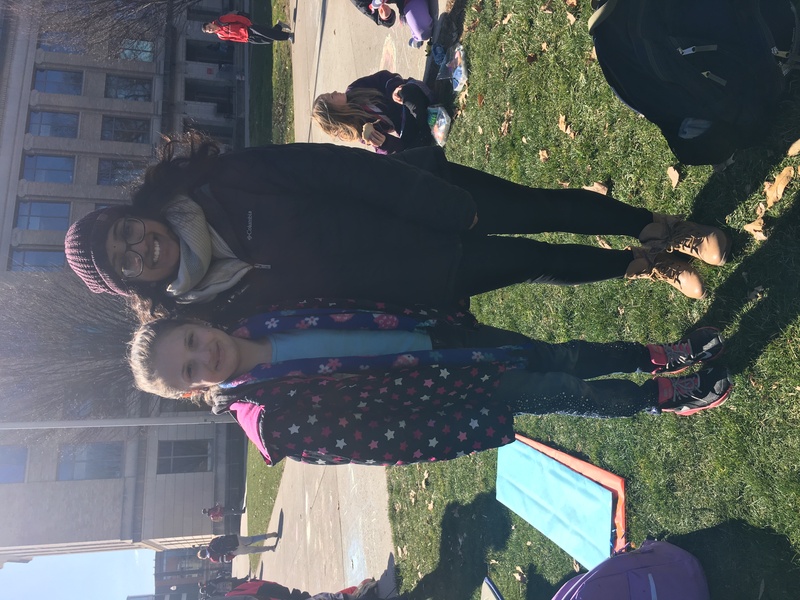 I feel like I was a mentor to my penpal, and she was really excited to meet me. She asked me a lot of questions about what I had to do to come to OSU and how hard I had to work. I would definitely join this organization again next year! I became a volunteer at the James during my second year at OSU. I first started out as an egress volunteer. I would have to move wheelchairs and gurneys back to their original positions. I would also help patients get where they needed to go. In the spring semester of sophomore year, I switched to the radiology unit. I helped patients check in and gave them any necessary information about their upcoming scans. I also helped patients get where they needed to go after their scans. The radiology unit was a lot more fun for me to work in. I had more contact with patients and got to help them. I plan on going back next semester! September 27th 2016 was my first weekend that I spent at college. I spent that morning in downtown Columbus walking 3 miles for the Columbus Heart Walk. The Heart Walk is an event that the American Heart Association’s created for raising funds to save lives from heart disease and stroke and for raising awareness of these diseases. This event was designed to promote physical activity and a healthy-heart living style. This picture was taken right before the walk started. I chose this event because I had never participated in anything like this. I had to do small community walks for high school, but I have never done a citywide walk. I think the thing that surprised me the most was the amount of people that came to this event. I knew that it was a big event, but I never thought it would be this big. I didn’t expect so many people to wake up on a Saturday morning to walk three miles. There were large companies that participated in this and there were just families that walked. This gave me a real sense of community which made me happy since I had just transitioned to a big college where I was still trying to settle. It was really nice to see so many people care about their health and other peoples’ health. 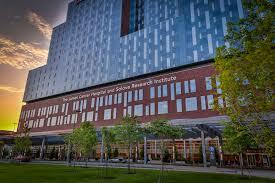 In the summer before my sophomore year, I started working as a research assistant at Nationwide Children’s Hospital. My supervisor is Dr. Anup Patel, who is the section chief for Neurology. I work mostly as a data collector. I collect the necessary information from patient’s charts and help analyze the data. I also help with writing publications. I became a volunteer at the James during my second year at OSU. I first started out as an egress volunteer. I would have to move wheelchairs and gurneys back to their original positions. I would also help patients get where they needed to go. In the spring semester of sophomore year, I switched to the radiology unit. I helped patients check in and gave them any necessary information about their upcoming scans. I also helped patients get where they needed to go after their scans. I feel like I really changed over my sophomore year. I learned from my mistakes that I made over freshman year. Academically, I learned better ways to study. I made more flashcards, went to office hours, and spent more time at Thompson to get rid of distractions. I took harder courses such as Organic Chemistry and Physics, but with these tips, I was able to get through both classes. I also joined more organizations and helped establish an organization. I joined OSU PenPals and B.R.A.I.N. I got a lot of service hours and formed a lot more friendships this year. A couple other BioSci Scholars and I formed the organization Fresh Start. It’s an organization that makes GoBags filled with hygiene products. These GoBags are given to homeless shelters. Freshman year, I signed up for a lot of organizations, but I never stuck with any of them. This year, I joined only a couple organizations that I was really interested in, and was able to participate in all of them. I was the Service Chair for the BRAIN organization and am the Treasurer for Fresh Start, so I got a lot more leadership positions this year. I started volunteering at the James Cancer Hospital this year and was able to get some more clinical hours. I had two positions this year. I first started out as an egress volunteer. I would have to move wheelchairs and gurneys back to their original positions. I would also help patients get where they needed to go. In the spring semester of sophomore year, I switched to the radiology unit. I helped patients check in and gave them any necessary information about their upcoming scans. I also helped patients get where they needed to go after their scans. The summer before sophomore year I became a research assistant at Nationwide Children’s Hospital. My supervisor is Dr. Anup Patel, who is the section chief for Neurology. I work mostly as a data collector. I collect the necessary information from patient’s charts and help analyze the data. I also help with writing publications. Overall, I feel like this year was a lot better than freshman year. I became more involved and felt more at home than I did freshman year! Click here for my First Semester review! Global Awareness is when students develop their appreciation for diversity and learn about different cultures. I plan to achieve this by studying abroad my sophomore year summer. I am also planning on joining Volunteers around the World. This is when students go to different countries such as Peru or the Dominican Republic and spend about 2 weeks there working in a medical clinic. There I can learn about different cultures while doing something that I love. Original Inquiry is when students display their independency by engaging in experiences like research, creative productions, or advanced course work. This is an important aspect of my life because I want to go to medical school one day. 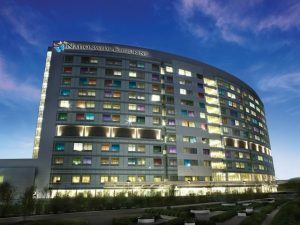 I spent the summer before 12th grade working with Dr.Flanigan at Nationwide Children’s. There I learnt about Duchenne Muscular Dystrophy and what causes it. I am hoping to continue that research with him this summer. Academic Enrichment is where students take rigorous coursework and participate in extracurriculars outside of the class. Since I am in the pre-med track, almost all of my classes are science based. I hope to branch out by taking some language courses as well as some social science classes. Leadership Development is when students develop skills that can help them lead their peers or anyone to do something that leads them to success. I plan to achieve this by joining a Mentor Program. I have already applied for the Children’s Service mentor program where I will work with younger kids and try to guide them in the right direction. Service engagement is when students provide service to their community. I get a lot of service hours from being in a Scholars program. But I also applied for a position at the Columbus free clinic where I can volunteer my time in helping people get what they need. I also plan on going to the Community Kitchen and serving meals to people. My name is Sravya Gedela and I am from Pittsburgh, PA where I lived for 13 years. I attended North Allegheny Senior High School where I graduated from a class of 650 students. 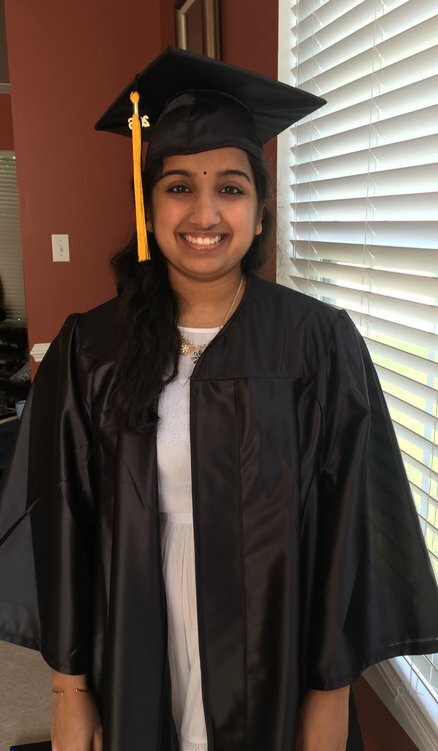 Throughout high school, I took various science courses and participated in extracurricular activities that helped me decide to have a career in the medical field. In 11th grade, I took an Anatomy and Physiology that made me realize I really wanted to make Neuroscience my major in college. My extracurricular activities mostly consisted of Student Council and Key Club where I had opportunities to help my community. Through activities like Secret Santa and tutoring little kids I realized that I wanted to have a career where I can work with kids. So I decided that I wanted to become a pediatric neurologist. I am excited to start my journey of studying medicine at OSU and I look forward to experiencing all the great things that Ohio State has to offer!